Fire sprinklers are generally installed within the heated envelope of a building and should not require frost protection. Frost protection will be required for pipe work, fittings and pump sets when they are likely to be exposed to temperatures below freezing, this may be an outhouse, garage, porch, sheds and even loft spaces. 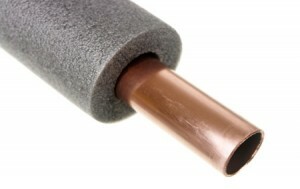 The thermal properties with CPVC pipe are such that it is already equivalent to lagged copper or steel pipe. However we recommend that all parts of the fire sprinkler system, that may be exposed to temperatures below freezing, are lagged and trace heated. Triangle Fire System fire pump sets are lagged and trace heated in our workshop prior to delivery to site. This is particularly important if the property is left unattended for a long period of time in the winter and we would advise that the heating is left on a ‘frost’ setting whilst unoccupied.